located in Trinity, Alabama. This website is only for our wholesale customers. Thank you! 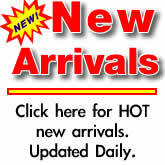 Thousands of 1st Quality Closeouts priced Below Wholesale. Marilyn Monroe Decorative Containers / Set of 2 - Licensed Marilyn Monroe boxes. Great for storing cosmetics. Available in full cases of two sets only. Dimensions: 6" x 5" x 7". Red Heart Boutique Ascot Lavish Blue Yarn - Made from 85% acrylic and 15% polyester. This kit includes 46 yards of yarn. The feel of the yarn is lavish, soft, and thick. 72 Piece Indian Chief Dinnerware - 8 Place Setting - The 32 pieces of dinnerware are accompanied by 40 pieces of silverware. 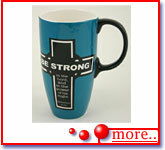 Be Strong in the Lord / Cross Tall Mug - Inspirational Christian scripture quote mug, extra tall for large cups of coffee or tea. 3.5" x 6.5". 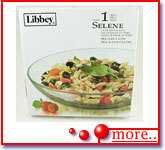 Libbey Glass Serving Bowl 12" - 12 in. across and 2.5 in. deep. Great for everyday meals or special occasions. Dishwasher safe. 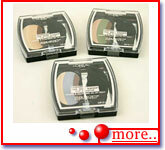 L'oreal One Sweep Eye Shadow 3 Assorted - each with 3 different eye shadow colors. Cases include 12 assorted units. 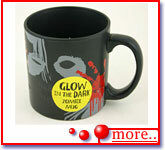 Zombie Glow in the Dark Oversized Mug - This large glow in the dark zombie mug will revive any zombie fan. Delivered in case packs of 8. 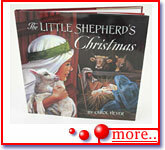 The Little Shepherd's Christmas Book - The ilustrated story of the child shepherd who visited baby Jesus on the first Christmas. Sold in case packs of 8. Dimensions: 10.5" x 10.5". MINIMUM ORDER ONLY $99.00 PER ORDER. MINIMUM PER ITEM IS ONE CASE. The buyers at Roden Imports are always looking for first quality closeouts. Please do not hesitate to contact us with any deal. With over 30 years experience, we are able to make QUICK decisions. Elvis Presley Hardback Journal. Measures 6.5" x 1" x 8.5"